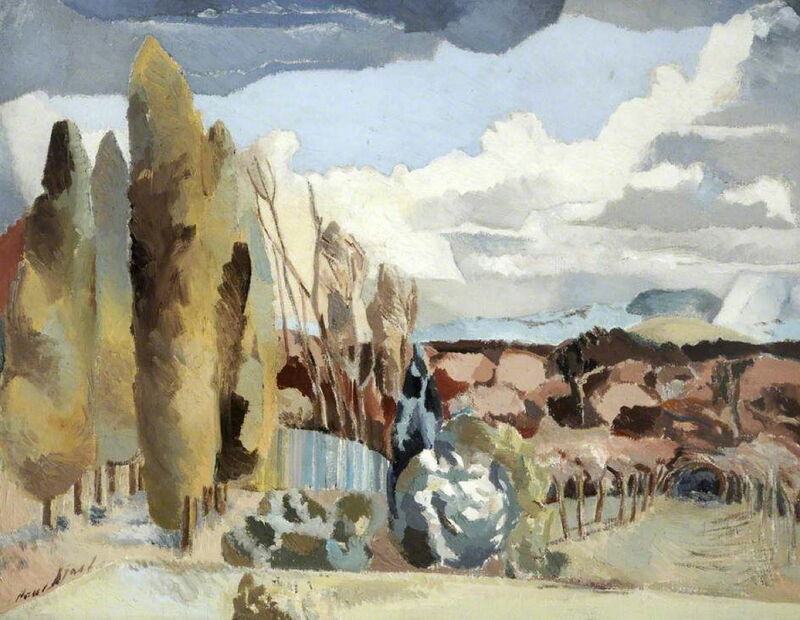 Paul Nash (1892–1946), March Landscape (1944), oil on canvas, 69.8 x 84.8 cm, Sheffield Museums, Sheffield, England. The Athenaeum. When Paul Nash was staying with Hilda Harrison in her house on Boar’s Hill, near Oxford, he could see a landscape which had come to obsess him from childhood: two hills (technically the Sinodun Hills) with clumps of trees at the top, the Wittenham Clumps. As he completed his final paintings of the Second World War, he turned to the Wittenham Clumps in series of paintings which accompanied his steadily declining health. Paul Nash (1892–1946), Landscape of the Bagley Woods (1943), oil on canvas, 56 x 86.3 cm, Private collection. The Athenaeum. Not far from Boar’s Hill is an ancient wood, owned by St John’s College, Oxford, which Nash depicts in his Landscape of the Bagley Woods (1943). Using his oil paint with the subtlety of watercolour, the rolling fields of the foreground are quickly replaced by dense woodland. At the leading edge of the wood, some trees assume the form of their foliage, and to the right is a large sphere. In the background, silhouetted against the distant downs, is one of the Wittenham Clumps. Above is a sky of broken cumulus, the sunlight forming shafts which cast right back to Nash’s paintings of the First World War. The next three paintings are from Nash’s Landscapes of the Moon series, which is dispersed across different collections and cannot be seen together. Paul Nash (1892–1946), Landscape of the Moon’s First Quarter (1943), oil on canvas, 63.3 x 71 cm, Birmingham Museums and Art Gallery, Birmingham, England. The Athenaeum. Landscape of the Moon’s First Quarter (1943) is set in the autumn, near Bagley Wood or one of the other woods near the Wittenham Clumps. It incorporates several of Nash’s favourite symbols: in the foreground, two spherical bushes echo the half moon above. A short avenue of poplars at the left is reminiscent of several of his earlier works, going right back to the First World War. In the distance at the right is the unmistakable form of a Wittenham Clump, behind which a bank of pale earth clouds towers like far mountains. Paul Nash (1892–1946), Landscape of the Moon’s Last Phase (1944), oil on canvas, 63.5 x 76.2 cm, Walker Art Gallery, Liverpool, England. The Athenaeum. 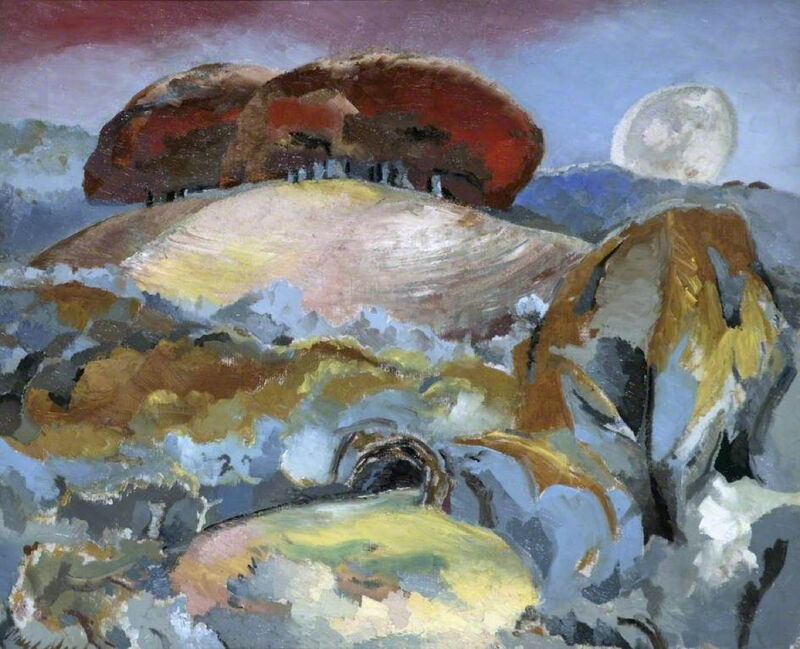 Landscape of the Moon’s Last Phase (1944) moves much closer to the Wittenham Clumps, which dominate the painting, the hillside glistening under the light of the moon. That moon is a puzzle, as at first sight it appears to be full, but Nash seems to have intended us to see only its brighter left crescent as being fully lit. In the foreground is more ancient woodland, here with a tunnel formed by the boughs, leading us through the dense trees and on to the Clumps beyond. The trees remain in autumn colours. 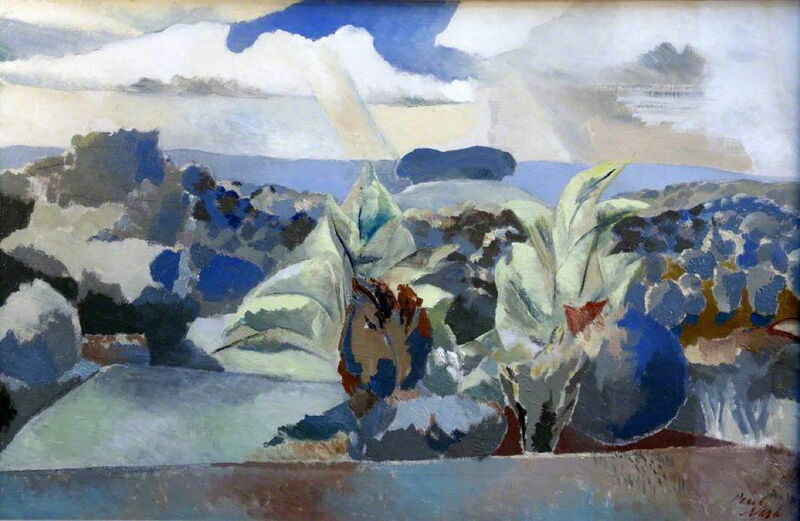 Paul Nash (1892–1946), Landscape of the Vernal Equinox (III) (1944), oil on canvas, 63.5 x 76.2 cm, Scottish National Gallery of Modern Art, Edinburgh, Scotland. The Athenaeum. 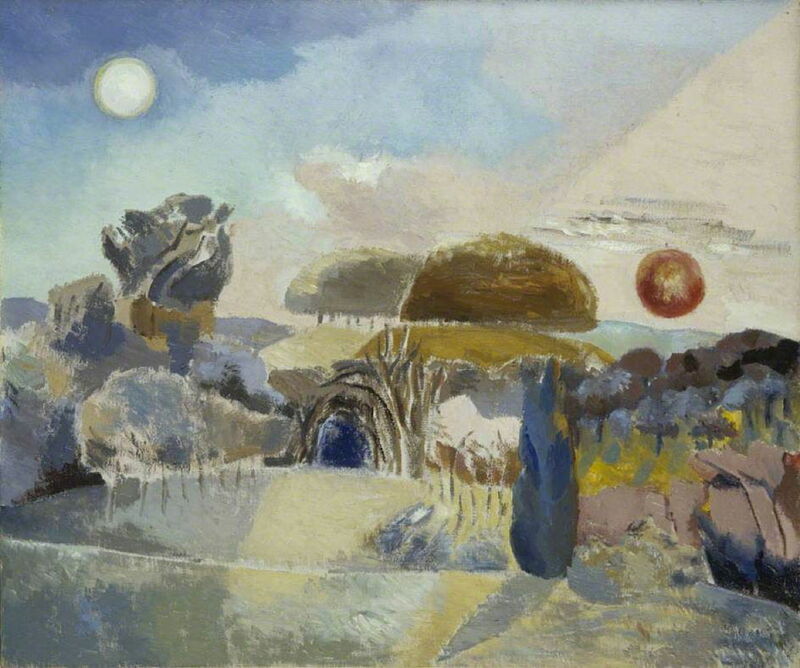 Similar themes recur in Nash’s Landscape of the Vernal Equinox (III) (1944), which appears to show the impossible view of a full moon and the sun visible close together and just above the horizon. The more distant of the Wittenham Clumps is now a pale shadow of the closer one. The entrance to the tunnel of boughs is near the centre of the painting and looks more compelling. 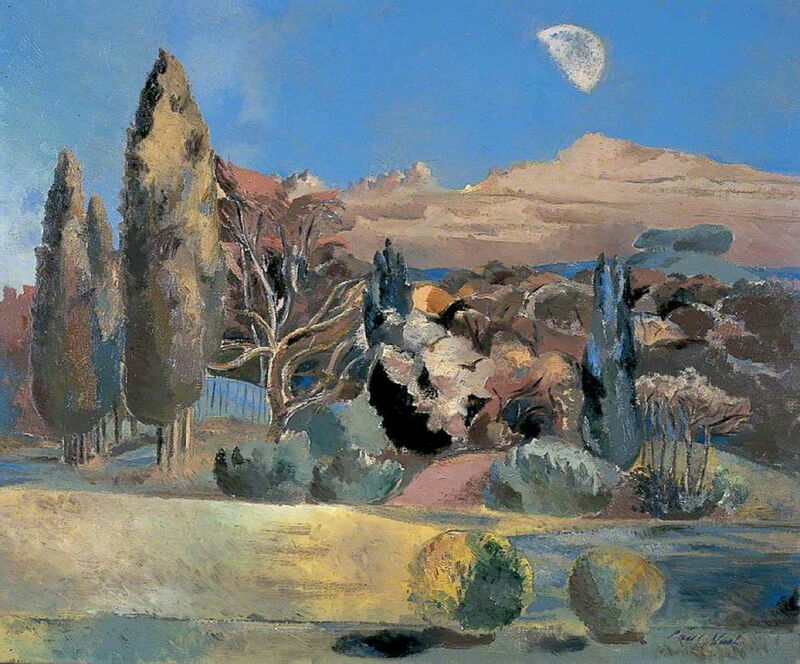 Although there is no moon visible in his March Landscape (1944), Nash recomposes similar elements to those in his Landscapes of the Moon series. The Wittenham Clump has receded into the distance, where it is lit by a shaft of sunlight. Two avenues of trees now compete for our gaze and perspective projection: at the left, poplars quickly peter out into dead skeletons and a high screening fence. At the right shorter trees close in to form a tunnel as their boughs overlap. In the centre foreground there is another pale spherical bush. Another visionary series of late paintings is Nash’s Aerial Flowers, which appear to have developed from his more recent wartime paintings of the Battle of Britain. 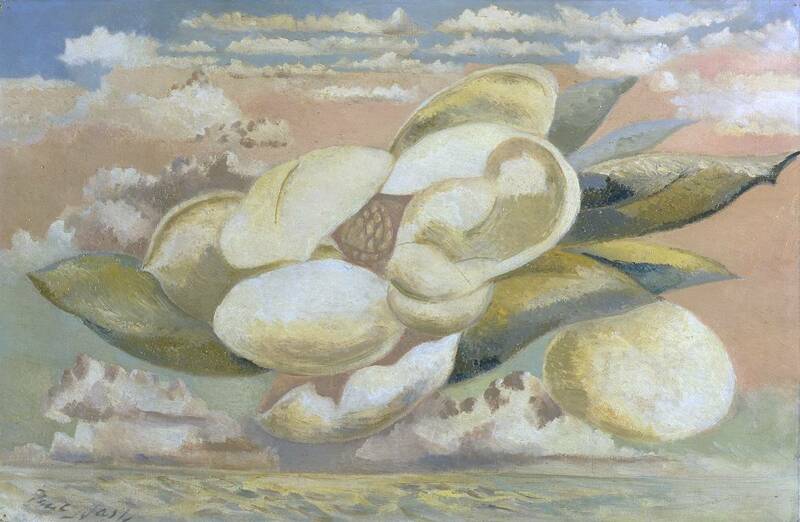 In Flight of the Magnolia (1944), a magnolia flower unfurls into the sky high above a low coastal landscape. Those vast, soft petals are set against a background of equally huge leaves, and beyond them a field of cumulus clouds so typical of an English summer. Those below the flower have heaped up to generate a shower in the far distance. One of the petals has a form which resembles the human pinna, and appears to contains a human shape, in which a head, trunk, and hand can be distinguished. Nash uses soft colours which are again more typical of watercolours than oils, although his paint layer is quite thick and textured in places. Nash made two watercolour studies for this in the summer of 1944, which were also inspired by a quick study of a magnolia flower which he had painted in September 1943, when on a trip to Dorset. When the war came, suddenly the sky was upon us all like a huge hawk, hovering, threatening. Everyone was searching the sky, expecting the terror to fall: I among them scanned the low clouds … hunting the sky for what I most dreaded in my imagining. It was a white flower. Ever since the Spanish Civil War the idea of the Rose of Death, the name the Spaniards gave to the parachute, had haunted my mind, so that when the war overtook us I strained my eyes always to see that dreadful miracle of the sky blossoming with these floating flowers. He had also – in common with many other artists before – shown the sky as the domain of souls, thus important to the event of death, a subject which was clearly occupying his mind more and more. These visionary images are more typical of William Blake, who was a major influence over Nash’s last works. Paul Nash (1892–1946), Eclipse of the Sunflower (1945), oil on canvas, 71.1 x 91.4 cm, British Council Collection, London, England. The Athenaeum. 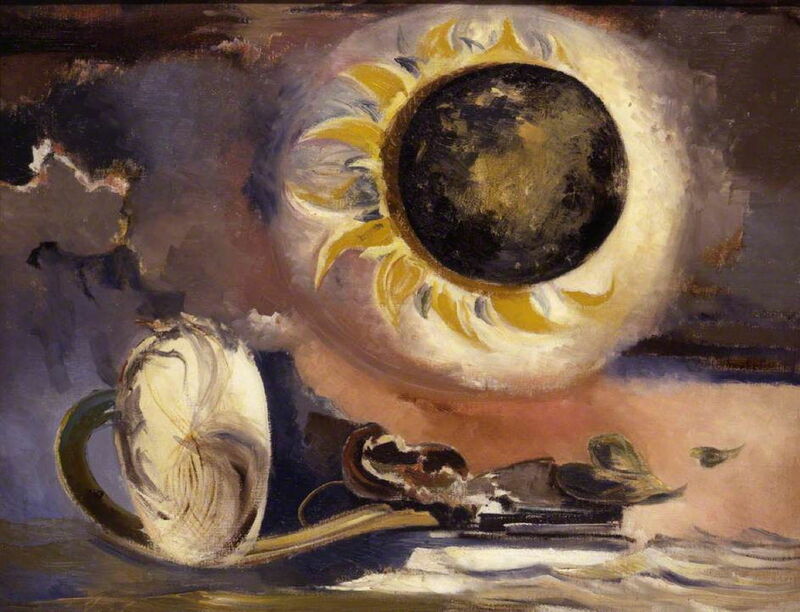 Nash shows a sunflower undergoing an eclipse, as if a celestial body. Below is a windswept sea and the coast of Dorset, as he had painted below the ‘flying boat’ in his Defence of Albion (1942). Just above that coast are more peculiar botanical structures relating to the sunflower, and behind is the threatening sky of an imminent storm. In July 1946, Nash returned to the Dorset coast. On 11 July, he died in his sleep from heart failure caused by his lifelong asthma. His travellers journey was done. Posted in General, Painting and tagged Blake, landscape, modernism, Nash, Oxford, painting, Surrealism, war artist. Bookmark the permalink. I thought these were watercolors but I see that they’re oil paintings. The higher keyed tonality and evenness in the imagery made them look like watercolors — perhaps also a bit of resemblance between these and certain paintings by William Blake. Well, very striking in any case. Enjoyed seeing them. Yes, he is one of the few artists whose watercolours are very hard to distinguish from his oils.